Founded in 1863, La Salle University is a private Roman Catholic institution based in Philadelphia, PA, with a total of 6,200 undergraduate and graduate students. The School of Business was founded in 1954, and today the Business Administration degree program is among the top three largest graduate programs offered by the university. La Salle maintains three campuses in the Philadelphia area. The 130-acre main campus, where all courses for full-time programs are held, is located in East Germantown at 20th Street and Olney Avenue in Philadelphia. La Salle’s satellite campus in Newtown, known as the Bucks County Center, was founded in 1997. The Montgomery County Campus, which opened in 2008 at the Metroplex Corporate Center in Plymouth Meeting, is the most recent addition to La Salle’s campus offerings. Both satellite campuses offer part-time coursework, which is offered on the main campus as well. The main campus is located roughly 30 minutes away from the Philadelphia International Airport. The School of Business is located in College Hall on La Salle’s main campus. College Hall houses both administrative and faculty offices as well as classrooms and videoconferencing facilities. In early 2016, the School of Business opened its new central home at Wister and Chew avenues; a $35 million, six-story, 87,000-square foot facility. The building comes complete with wireless infrastructure, a large atrium, a 400-seat auditorium, advanced classroom designs, boardroom, and sales training facilities. Students may use commuter lounges and meeting spaces in the Student Union, study at the Connelly Library, and avail themselves of a variety of athletic and dining facilities. Students in the Full-Time and One-Year programs are eligible for on-campus housing. The Bucks County location offers classrooms and computer labs, with spaces ranging from 16-seat conference rooms to 60-seat classrooms. Most rooms have built-in presentation technology, and portable equipment is available for rooms without this technology. In Plymouth Meeting, the Metroplex Corporate Center’s facilities house classrooms, a computer lab, an all-purpose room and administrative offices. 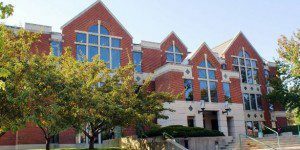 By a recent count, the La Salle University School of Business has 33 faculty members, including full-time tenured and adjunct and associate members. Recent reports state that 245 students are enrolled across the La Salle School of Business’s graduate degree programs. The university enrolls over 6,600 students with around 4,200 pursuing undergraduate degrees. Applicants to the La Salle School of Business can choose among four degree-earning options. These include a full-time MBA, an accelerated One-Year MBA, a Saturday MBA, and a flexible part-time MBA that holds classes in the evenings, on weekends and in a distance learning format. Those wishing to complete their MBAs abroad may pursue an intensive weekend program that spans 15 months of study in Switzerland at the Basel Chamber of Commerce. Additionally, students have the option to complete the MBA program in a hybrid online format.